This provides information about our activities and our social and fund-raising events. Whether you are an individual or an organisation, we shall be delighted to hear from you. It does not matter if you cannot take an active part in our activities: your moral and financial support would be greatly appreciated. Your subscriptions will be used to cover the administrative costs incurred by the Society and to help fund our projects. If you believe our surroundings matter and want to ensure that future generations enjoy them too, please help us by giving a donation, every little helps. Organise the blue Civic Society historical information plaques attached to buildings where notable people lived. 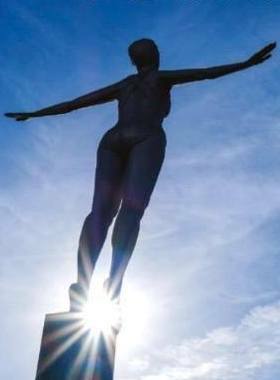 Commissioned public art for Scarborough: the Diving Belle, the Bathing Belle and ?Belief? Read and respond to important planning applications submitted to the Council. Publish guide books and information leaflets for residents and visitors. Publish regular newsletters to keep everyone informed of what's happening to our town and our Society. Organise guided historical walks, lectures and meetings. Fund-raise for projects such as the restoration of shelter seven in South Cliff Gardens. To promote civic pride in the beauty, history and character of Scarborough and its surroundings. To encourage high quality developments which lead to an improved living and working environment for us to enjoy.